Tier 3 schematics allow you to craft some of the most powerful weapons, armor and arms/legs upgrades in the game, but actually finding them can be quite a chore. Considering that many of these schematics are random drops, it is difficult to find more than a couple in a typical playthrough. This is why I like to use a specific farming method to get multiple tier 3 schematics in just a few minutes. Update: With the release of the Black Emporium, you can buy most tier 3 schematics. 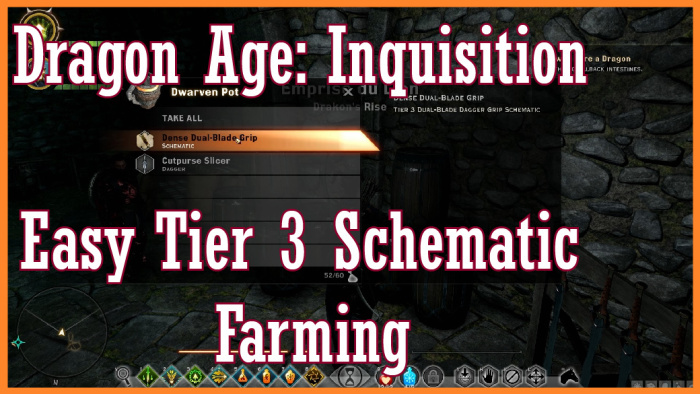 Some Armor Upgrade schematics still require farming, however. Get the Deft Hands Perk from the war table room in Skyhold. It is found under the “Secrets” tab. Fast travel to Drakon’s Rise Camp in Emprise Du Lion. Go to Valeska’s Watch. Clear out the Darkspawn, and open the locked door (this is what the Deft Hands perk is for). 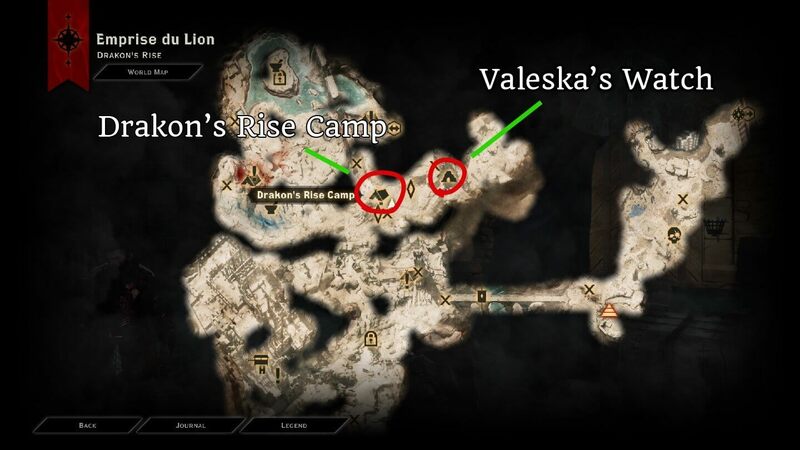 Map of Emprise Du Lion showing the farming location at Valeska’s Watch. In the room are 2 chests capable of spawning tier 3 schematics. What we’re going to do now is check the chests – if they have any schematics, take them, but leave at least 1 other item in the chest. This will make the chests respawn with new loot every time you save and reload your game. Save your game. Load that same save. The chests will now have new loot in them. Rinse and repeat – if you find a schematic, take it and save the game, and then reload that same save. I got 4 schematics in about 2 minutes by doing this, so you can farm very quickly. Thank you for this. I will be trying this method. I am on my 2nd game on nightmare. This will do good to prepare me for dragons. Is it ever possible to get masterwork tier 3s with more then one item in a chest? I find it almost impossible to find. Cradle of Sulevin has 24 tier 3 chests you can use this method on, instead of saving/reloading, leave the area (travel to a camp, not Skyhold, or you’ll have to party select again) and come back to it. To get to Cradle of Sulevin, keep going north from the entrance of Valeska’s watch, past a rift until you find some dead elves next to a cliff. There’ll be a note on the ground next to them that will trigger a new available operation. Return to your war table to complete the operation that will allow you to enter the area from the world map.